Happy Monday friends! We hope you all had a relaxing and productive weekend. When we were together in Arizona a few weeks ago, we had the chance to try aerial yoga for the first time. We wanted to share our experience with you as many people have asked us what we thought of the class. While we have both been to yoga classes before, this was our first aerial yoga class. The class utilized the colorful hammocks the entire time. We started out with some stretching using the silks to help us stretch further. Then we moved into practicing yoga poses such as tree pose and downward dog. The instructor saved the best for last as we finished with inversions (flipping upside down). We were excited about the inversions since it is the most unique part of aerial yoga however we were a little timid at first since we had to rely on the silks to hold us up. The class lasted about an hour and the instructor was nice enough to save time at the end of class for photos (score!). Overall, we really enjoyed the aerial yoga class. It was a unique, fun workout and we were able to stretch and improve our yoga skills. It was definitely enjoyable to take the class together and we recommend using buddy system for your first time. 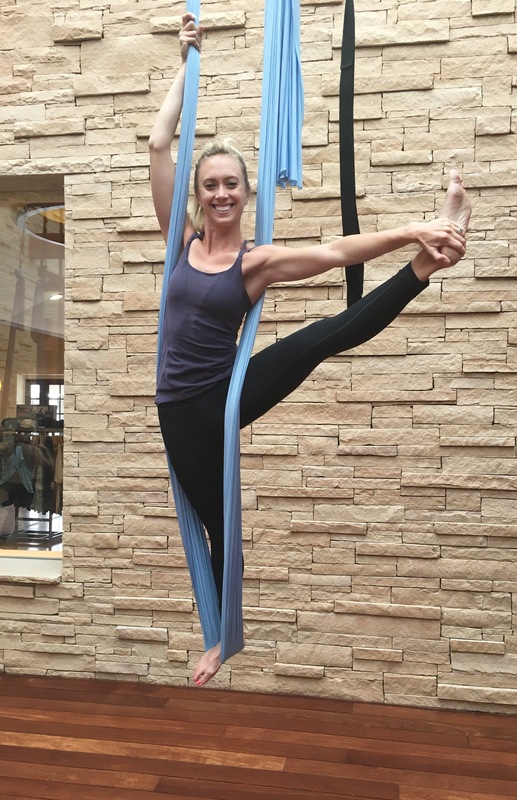 Hopefully we can practice aerial yoga again in the future (bonus if it is together)! Namaste and have a great week!